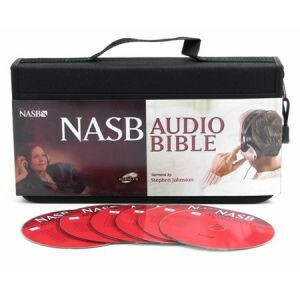 Enjoy the precision and power of the complete NASB version any time, anywhere with this voice only edition. Narrated by Stephen Johnston. Known for its accuracy, the New American Standard Bible, updated edition, is the number one choice for in-depth inductive Bible study. 58 high quality CDs have been digitally mastered in stereo for enhanced listening enjoyment. This fresh reading by master narrator Stephen Johnston of the whole NASB includes helpful and informative introductions for each book of the Bible. The CDs come packaged in their own top-quality carrying case, providing a handy way to protect and organize these treasures for years to come.